Santa Lucia is the main train station. 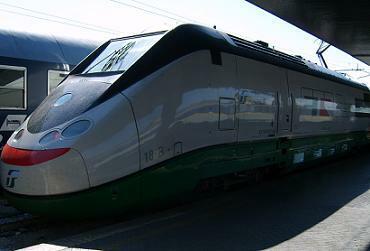 The train station is located at the border of historic Venice close to the bus station (500m). Santa Lucia is connected with main cities as Rome, Milan, Florence, Paris, Vienna, Munich and Zurich. 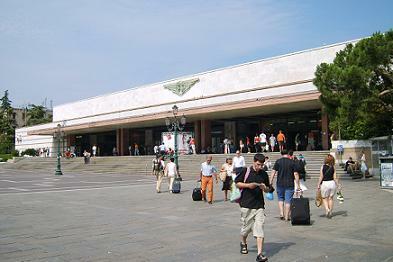 The other train station in Venice – Venezia Mestre – is just before Santa Lucia on the mainland (8km away). Between the mainland and the historic centre is the Liberty Bridge. Most residents of Venice live on the mainland and not in the (expensive) historic centre. The small cabin on the water with the yellow band (picture above) is water bus stop “Ferrovia” (ferrovia=railroad). The ticket windows are in the larger cabin, also on the waterfront. The smaller white boats are private water taxi’s. The public transportation on the water is called ‘water bus‘ or ‘Vaporetto’. The most important route is waterbus Line 1. 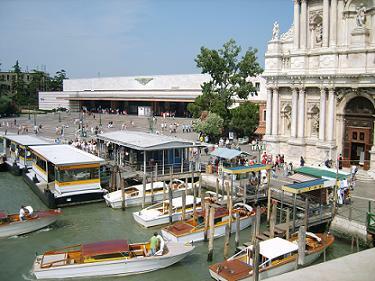 On the backside of the Santa Lucia station is a square bordering the Grand Canal. Here you will find the waterbus stop of the train station. The waterbus stop of the bus station is at Piazzale Roma, 500 meter away. A water bus ticket cost €7.50. An One-Day Card cost €20. Tickets are sold at ticket windows, in newspaper kiosks and from self-service automatic machines. The white boats on the picture, before the boat station, are private taxi boats. It cost €100 for 1-3 persons from the Venice Marco Polo Airport to a hotel in the historic centre. A group up to 6 persons p €125. The information desk after the customs at the airport can book a private water taxi and give you information. There is a walkway to the dock. Much cheaper is the public water taxi from the airport: an e-ticket is €14 p.p. A shared water taxi transfer cost €25 per person. Difference between the public- and shared water taxi is that the public water taxi follows a fixed (longer) route.